This tutorial was written by Angela on April 30th, 2015. Any resemblance to any other tutorials is purely coincidental! You may not copy/paste any part of my tuts elsewhere, but you may text link to them for challenges etc! You can find this gorgeous tube by ©Fedor here. 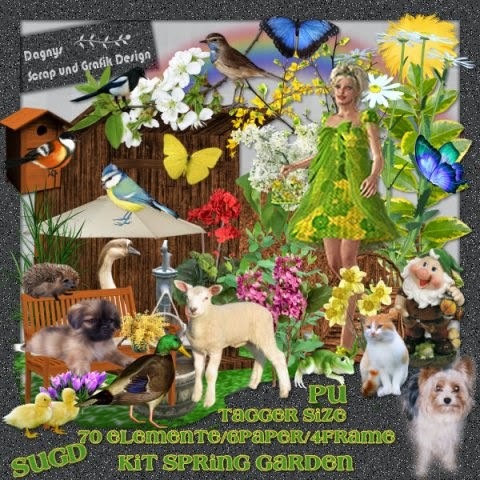 You can her amazing kit in S&Co store here. Copy & Paste to your canvas. Resize & Position to the center. Copy & Paste to bottom layer. Resize & Position to the center beneath tube as if tube is laying on it. Cope & Paste to bottom layer. Resize and Position add to left side. Copy & Paste to top layer. Resize & Position add to right side put as if in her hand. Copy & Paste to bottom layer. Resize & Position add to center top. (Duplicate x2) Add as you wish. Copy & Paste to layer just below chair. Resize & Position add to left side behind chair. Flip by pressing ctrl+M and rotate as I have done. Copy & Paste to layer just below tube. Resize & Position add to center bottom and place as if tube is on it as I have done. Copy & Paste to layer just below wood. Resize & Position add to left side and place under wood. ( Duplicate x3) add copies all the way down the wood. Copy & Paste to layer just above palm. Resize & Position add to center just above tube. Copy & Paste to layer just above jeep. Resize & Position add to right side just behind tubes head. (Duplicate) and add copy up on palm tree. Copy & Paste to layer just below wood. Resize & Position add next to chair. Flip by pressing ctrl+M. This tutorial was written by me on April 29th, 2015. Any resemblance to any other tutorials is purely coincidental! You may not copy/paste any part of my tuts elsewhere, but you may text link to them for challenges etc! 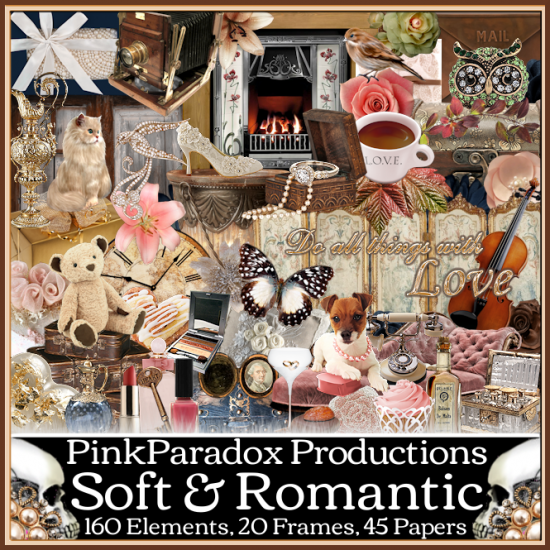 **New CT Tag** Scrap Kit of choice, I am using a PTU Scrapkit called *Soft & Romantic* By Pink Paradox Productions. Copy & Paste to canvas. Resize and Position add to center of your canvas. Copy & Paste to bottom layer. Resize & Position add to right side of tube center. (Duplicate) mirror image by pressing ctrl+B. Copy& Paste to top layer. Resize & Position add to center bottom part of tube. Select tube layer then select eraser tool and erase your bottm part of the tube below this element. Copy & Paste to top layer. Resize & Position add to center bottom up next to (87). Copy & Paste to layer just below tube. Resize & Position add to fit around frame (21). (Duplicate) mirror image by pressing ctrl+B. Copy & Paste to layer just below tube. Resize & Position add to right side to top of frames. (Duplicate) resize smaller and move copy to left side bottom of frames. Copy & Paste to top layer. Resize & Position add to right bottom of frames. Copy & Paste to top layer. Resize & Position add to right bottom as if bear is holding the cup. Copy & Paste to bottom layer. Resize & Position add to center bottom. Copy & Paste to layer just below tube. Resize & Position add to left top on frames. Rotate until it fits the frame. (Duplicate x3) add to other side by pressing ctrl+B. Then flip two of the copies and add them to the bottom of the frames. Copy & Paste to layer just below tube. Resize & Position add to left bottom. Flip by pressing ctrl+M. Copy & Paste to top layer. Resize & Position add to left bottom on (68) as I have done. Copy & Paste to bottom just before mask layers. Then add to fit in your frames. Then use your Eraser Tool and erase the extra outside the frames. Then duplicate and mirror image tube layer. Then adjust the tube as you wish.. This tutorial was written by Angela on April 28th, 2015. Any resemblance to any other tutorials is purely coincidental! You may not copy/paste any part of my tuts elsewhere, but you may text link to them for challenges etc! You can her amazing kit in Pics For Design store here. Copy & Paste to bottom layer. Resize & Position to the center beneath tube as if tube is sitting on it. Cope & Paste to layer just below tube. Resize and Position add to right side of AK-E-31. (Duplicate) Flip by pressing ctrl+M and move to left side of AK-E-31 and blend in. Copy & Paste to bottom layer. Resize & Position add behind AK-E-31 and blend in behind. Copy & Paste to bottom layer. Resize & Position add to center of your canvas. Blend in as you wish. Copy & Paste to layer just below AK-E-31. Resize & Position add to left side blend in with the flowers. Add to bottom so it is the bottom layer. Select your Picture Tube Tool then go up and select the tube for grass. Add grass as you like. This tutorial was written by me on April 26th, 2015. Any resemblance to any other tutorials is purely coincidental! You may not copy/paste any part of my tuts elsewhere, but you may text link to them for challenges etc! 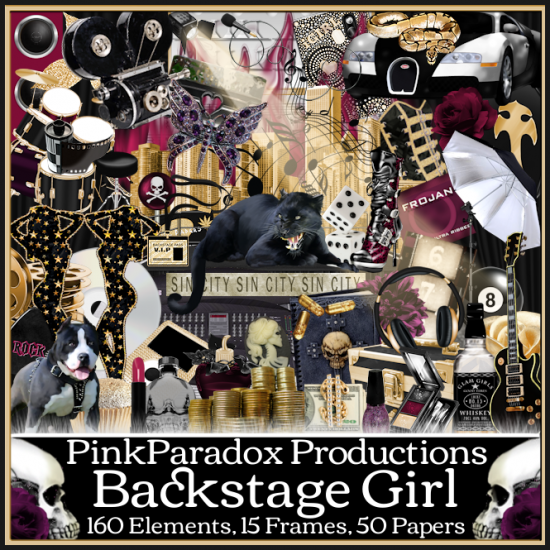 **New CT Tag** Scrap Kit of choice, I am using a PTU Scrapkit called *Backstage Girl* By Pink Paradox Productions. Copy & Paste to top layer. Resize & Position add to center bottom of tube. Select Eraser Tool make sure your tube layer is selected and erase bottom part of tube below this element. Copy& Paste to bottom layer. Resize & Position add to right side then rotate. Copy & Paste to layer just below tube. Resize & Position add to center behind your tube as I have done. Copy & Paste to layer just below (47). Resize & Position add to left side and rotate. Copy & Paste to bottom layer. Resize & Position add to center of work. Copy & Paste to layer just above (46). Resize & Position add to left side rotate then blend in with bottom elements as I have. Copy & Paste to layer just below (45). Resize & Position add to right side bottom flip by pressing ctrl+M. Blend in. Copy & Paste to layer just below tube. Resize & Position add to left side right next to tube blend in with coin element. Copy & Paste to layer just below (63). Resize & Position add to left side flip by pressing ctrl+M blend in as you wish. Copy & Paste to bottom layer. Resize & Position add to center of canvas. Copy & Paste to layer just above mask layer. Resize & Position add to top part of creation. This tutorial was written by Angela on April 24th, 2015. Any resemblance to any other tutorials is purely coincidental! You may not copy/paste any part of my tuts elsewhere, but you may text link to them for challenges etc! 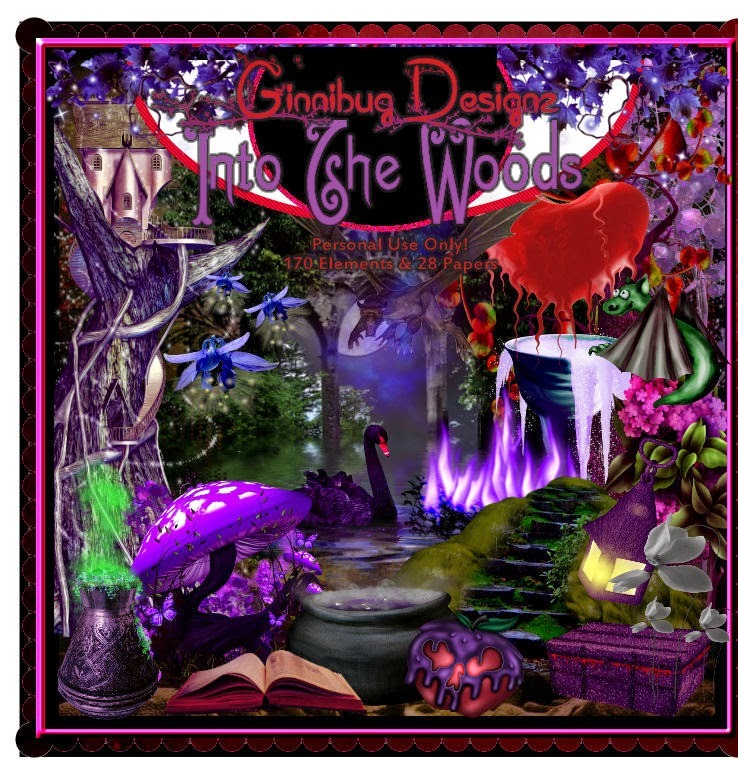 You can her amazing kits in her store here. Copy & Paste to bottom layer. Resize & Position to the center behind your tube. Cope & Paste to top layer. Resize and Position add to bottom of work as I have done. (Duplicate) flip vertical by pressing ctrl+I then move copy to top of frame move down behind tube layer. Copy & Paste to top layer. Resize & Position add to bottom then move to left from center. (Duplicate) with copy mirror image by pressing ctrl+B. Copy & Paste to layer just below tube. Resize & Position add to right side place behind tube. (Duplicate) with copy mirror image by pressing ctrl+B. Copy & Paste to layer just below (1). Resize & Position add to left side bottom blend in with the flowers. Copy & Paste to layer just below tube. Resize & Position add to right side bottom blend in with flowers. Copy & Paste to layer just below top (26). Resize & Position add to right side center of frame. (Duplicate) with copy mirror image by pressing ctrl+B. This tutorial was written by me on April 23rd, 2015. Any resemblance to any other tutorials is purely coincidental! You may not copy/paste any part of my tuts elsewhere, but you may text link to them for challenges etc! 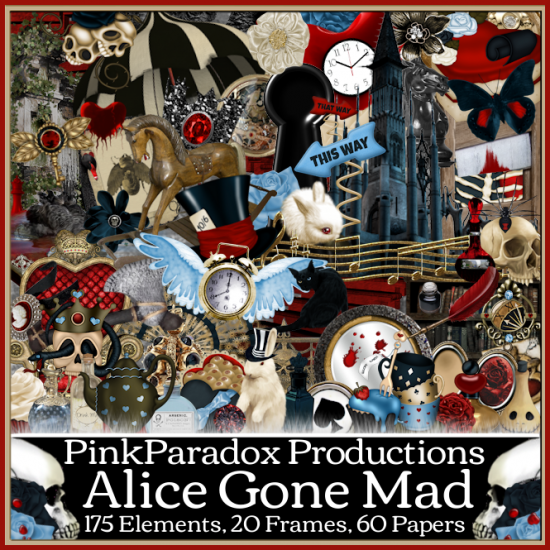 **New CT Tag** Scrap Kit of choice, I am using a PTU Scrapkit called *Alice Gone Mad* By Pink Paradox Productions. Copy & Paste to bottom layer. Resize & Position add to center bottom of tube. Copy& Paste to layer just below tube. Resize & Position add to left bottom corner of frame. Copy & Paste to layer just below tube. Resize & Position add right bottom corner of frame. Copy & Paste to layer just below tube. Resize & Position add to left bottom corner behind Alice Gone Mad (34). Copy & Paste to top layer. Resize & Position add to bottom center. Rotate as I have done if you desire. Copy & Paste to bottom layer. Resize & Position add as fit inside frame. Copy & Paste to layer just below tube. Resize & Position add to right bottom beside tube. (Duplicate) Mirror image by pressing ctrl+B. Copy & Paste to top layer. Resize & Position add to bottom center. Rotate to fit in front of (99). Copy & Paste to layer just above frame. Resize & Position add to right side corner of frame. Rotate (duplicate) and with copy just move it down below on frame as I have done. Copy & Paste to layer just above (95). Resize & Position add to right side corner of frame. Rotate (Duplicate) and with copy just move down below again on frame as I have done. Copy & Paste to bottom layer. Resize & Position add behind frame adjust to fit inside frame. This tutorial was written by me on April 22nd, 2015. Any resemblance to any other tutorials is purely coincidental! You may not copy/paste any part of my tuts elsewhere, but you may text link to them for challenges etc! 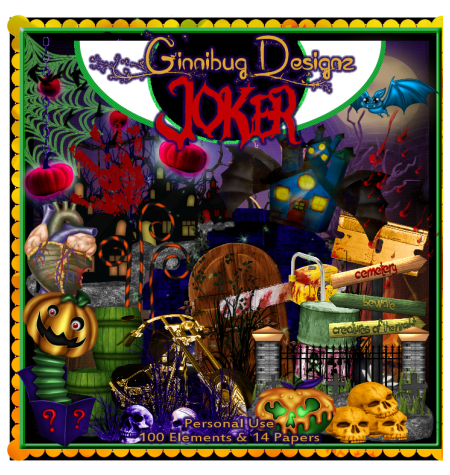 Tube or Image of choice, I am using a PTU Tube *Joker* By ©katharine can be found here. Copy &Paste to bottom layer. Resize & Position add to center behind tube. Copy & Paste to layer just below tube. Resize & Position add to bottom right corner of j1 frame. Copy & Paste to layer just above j1 frame. Resize & Position add to right side and blend it in behind j4. Copy & Paste to top layer. Resize & Position add to bottom of tube center. Copy & Paste to layer just above j17. Resize & Position add to bottom as if tube is on it. Copy & Paste to layer just below j16. Resize & Position add to right side. Flip by pressing ctrl+M. Copy & Paste to layer just below j28. Resize & Position add to right side between tube and tree. Flip by pressing ctrl+M. Copy & Paste to layer just below j28. Resize & Position add to right side and blend in. (Duplicate) mirror image by pressing ctrl+B. (Duplicate) each sides to make brighter if you wish too. Copy & Paste to layer just below tube. Resize & Position add to left bottom. Copy & Paste to layer just below j68. Resize & Position add to left bottom right behind j68. Flip by pressing ctrl+M. Copy & Paste to layer just below tube. Resize & Position add to right bottom right beside tube. Copy & Paste to layer just above j65. Resize & Position add to center behind tube add as you wish. Copy & Paste to layer just above j65. Resize & Position add to top center. 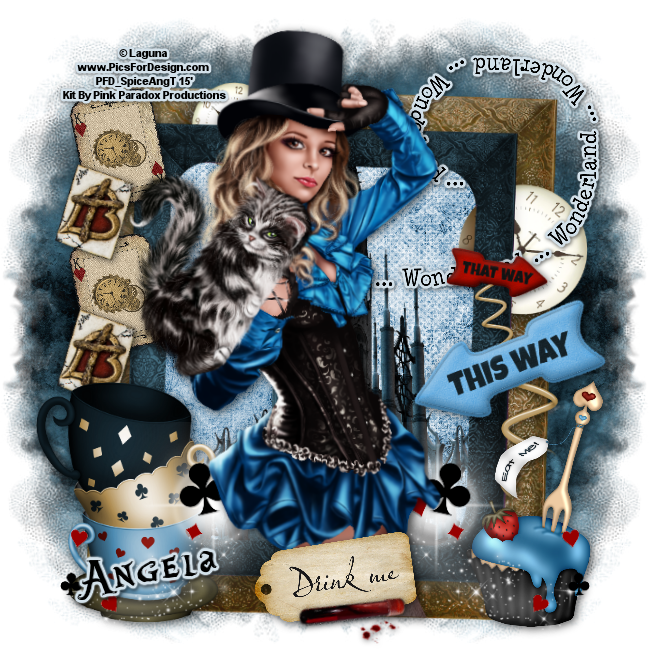 This tutorial was written by Angela on April 21st, 2015. Any resemblance to any other tutorials is purely coincidental! You may not copy/paste any part of my tuts elsewhere, but you may text link to them for challenges etc! Cope & Paste to layer just behind tube. Resize and Position add to corner of frame anyone you wish to start with. Flip by pressing ctrl+M. (Duplicate) then mirror image it by pressing ctrl+B. (Duplicate) and move to bottom corner of frame and do as you did on top. Copy & Paste to layer just below tube. Resize & Position add to left top corner of frame. Copy & Paste to layer just below tube. Resize & Position add to right top corner of frame. Copy & Paste to layer just below tube. Resize & Position add just beside tube on left side. Copy & Paste to layer just below tube. Resize & Position add to center left as I have done. Copy & Paste to layer just below tube. Resize & Position add to bottom right down by legs of tube. Copy & Paste to bottom layer. Resize & Position add to fit in frame. Copy & Paste to layer just above (175). Resize & Position add to bottom left corner of frame then duplicate 2 more copies. Add along the bottom of frame as I have done. The middle one you can do as I have done by pressing ctrl+I. This tutorial was written by me on April 20th, 2015. Any resemblance to any other tutorials is purely coincidental! You may not copy/paste any part of my tuts elsewhere, but you may text link to them for challenges etc! 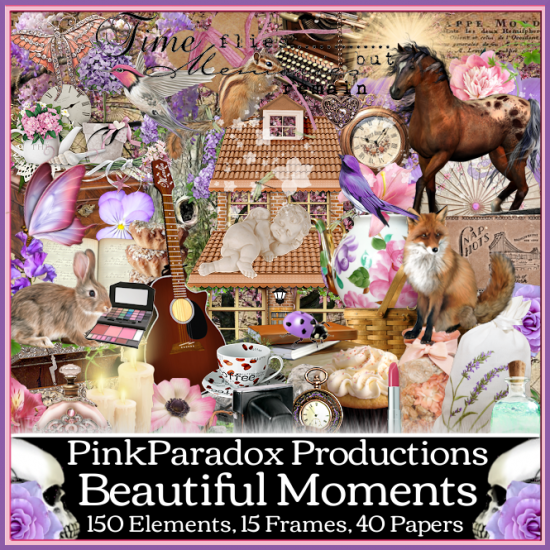 **New CT Tag** Scrap Kit of choice, I am using a PTU Scrapkit called *Beautiful Moments* By Pink Paradox Productions. Copy & Paste to canvas. Resize and Position add to right side center on canvas. Copy & Paste to bottom layer. Resize & Position add to center bottom so tube looks as if she is sitting on the grass. Copy& Paste to top layer. Resize & Position add to the left side center. Copy & Paste to layer just below tube. Resize & Position add behind your tube. Flip by pressing ctrl+M. Copy & Paste to bottom layer. Resize & Position add to center and blend in to the back. Copy & Paste to layer just below tube. Resize & Position add to left of your tube. Flip by pressing ctrl+M. Copy & Paste to layer just below tube. Resize & Position add as if books are sitting in the grass. Copy & Paste to layer just above (146). Resize & Position add to left side add as you like or as I have done. Copy & Paste to layer just below tube. Resize & Position add to right side just behind your tube and blend in. Copy & Paste to top layer. Resize & Position add to center upper part of your work. Flip by pressing ctrl+M. Copy & Paste to top layer. Resize & Position add to left side bottom corner. Flip by pressing ctrl+M. This tutorial was written by Angela on April 19th, 2015. Any resemblance to any other tutorials is purely coincidental! You may not copy/paste any part of my tuts elsewhere, but you may text link to them for challenges etc! Andrea, comes with two different hair colors and 4 different colored tops. You can find ©Spazzd Art gorgeous work here. Cope & Paste to top layer. Resize and Position add to bottom center behind tube. (Duplicate) with copy we are going to mirror image it by pressing ctrl+B. Copy & Paste to top layer. Resize & Position to bottom just off to the left side. Copy & Paste to bottom layer. Resize & Position to the center behind tube. Copy & Paste to layer just above a60. Resize & Position add to left side up against a60 as I have done. (Duplicate) with copy we will mirror image it by pressing ctrl+B. Copy & Paste to layer just above a60. Resize & Position add to left side blend in behind a62. (Duplicate) with copy we are going mirror image by pressing ctrl+B. Copy & Paste to layer just below a15. Resize & Position to right side bottom and blend in. Copy & Paste to top layer. Resize & Position to right side on top of a112 and blend in. Copy & Paste to top layer. Resize & Position to right side up some from middle. Copy & Paste to layer just above a60. Resize & Position to right side toward the bottom blend into back. (Duplicate) with copy we are going to mirror image it by pressing ctrl+B. This tutorial was written by SpiceAng on April 17th, 2015. Any resemblance to any other tutorials is purely coincidental! You may not copy/paste any part of my tuts elsewhere, but you may text link to them for challenges etc! You can find this amazing kit in her blog here. Copy & Paste to your canvas. Resize & Position to the center. Flip by pressing ctrl+M. Copy & Paste to bottom layer. Resize & Position to the right side middle. Copy & Paste to top layer. Resize & Position to the left bottom corner of last action we just added. Copy & Paste to bottom layer. Resize & Position add to center in the middle of your canvas. Copy & Paste to layer just above e11. Resize & Position add to the left side and blend in with bottom layer. Rotate if you wish as I have done. (Duplicate) then mirror image copy by pressing ctrl+B. You may want to rotate your copy. Copy & Paste to layer just below e04. Resize & Position to left bottom behind purple flowers. Copy & Paste to top layer. Resize & Position to the right side and add to e21. (Duplicate) add where you wish and as many as you want. Copy & Paste to top layer. Resize & Position to right side and add where you wish. Copy & Paste to top layer. Resize & Position to right side and add in front of of stool. Flip by pressing ctrl+M. Copy & Paste to layer just below e04. Resize & Position to left side and blend in with your other flower layers. Flip by pressing ctrl+M if you wish to do so. This tutorial was written by me on April 16th, 2015. Any resemblance to any other tutorials is purely coincidental! You may not copy/paste any part of my tuts elsewhere, but you may text link to them for challenges etc! 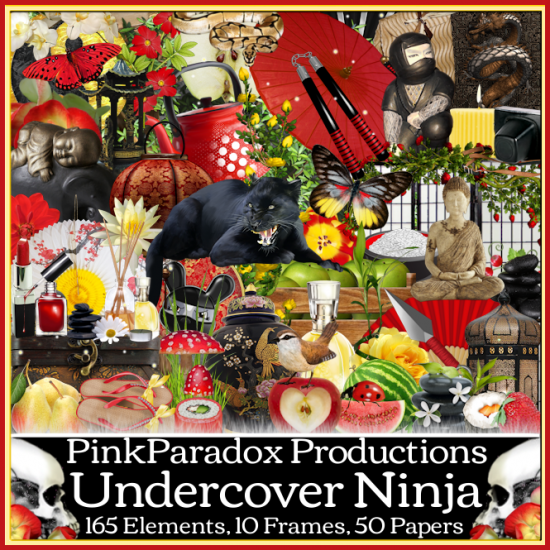 **New CT Tag** Scrap Kit of choice, I am using a PTU Scrapkit called *Undercover Ninja* By Pink Paradox Productions. Copy & Paste to canvas. Resize and Position add to center of your work. Copy & Paste to bottom layer. Resize & Position add to the center of your canvas. Copy& Paste to layer just below tube. Resize & Position add to the right side up next to (84). Flip by pressing ctrl+M. Copy & Paste to layer just above bottom. Resize & Position to the center lower part behind your tube. Copy & Paste to layer just above (83). Resize & Position add to top of bench layer as if it was sitting on the bench. Place it off to the right side on bench. Copy & Paste to layer just above (83). Resize & Position to the left side and place on top of bench as if it is sitting on it. Copy & Paste to layer just above (84). Resize & Position add to center and fit to your bottom layer. Copy & Paste to layer just above (94). Resize & Position add to right side. Blend in behind your bench flip by pressing ctrl+M. Copy & Paste to layer just above (94). Resize & Position add to right side middle. (Duplicate) with copy we are going to mirror image it by pressing ctrl+B. Copy & Paste to layer just above your tube. Resize & Position add to center bottom down by your tubes legs. Copy & Paste to layer just above (47). Resize & Position add to the top of plate off to the left side. Copy & Paste to layer just below (45). Resize & Position add to top of plate off to right side. Copy & Paste to top layer. Resize & Position add to plate in front of bowl of rice. Copy & Paste to top layer. Resize & Position add to the center of plate. Flip by pressing ctrl+M and rotate if you wish as I have done. Copy & Paste to layer just above (94). Resize & Position add to top center of your work as I have done. Copy & Paste to layer just below tube. Resize & Position to the left side next to bench. Flip by pressing ctrl+M. Copy & Paste to layer just below (148). Resize & Position to the left side behind bench and tiger. (Duplicate) then we are going to mirror image by pressing ctrl+B. Copy & Paste to layer just below (76). Resize & Position to the center bottom of your work. (Duplicate) then flip your copy by pressing ctrl+M. This tutorial was written by me on April 15th, 2015. Any resemblance to any other tutorials is purely coincidental! You may not copy/paste any part of my tuts elsewhere, but you may text link to them for challenges etc! You can purchase her kits from these stores just click on the links. Tube or Image of choice, I am using a PTU Tube *Grad Pup* By ©Spazzd Art can be found here. Copy &Paste to bottom layer. Resize & Position a little to the left from the center of your work behind your tube. Copy & Paste to layer just below tube. Resize & Position add to left bottom corner of books. Rotate the diploma if you like as I have done. Copy & Paste to layer just below tube. Resize & Position add to right side up against books. Copy & Paste to layer just below diploma. Resize & Position add to center and place as if tube is sitting on the laptop. Copy & Paste to layer just below tube. Resize & Position add to center to upper top of books. Copy & Paste to top layer. 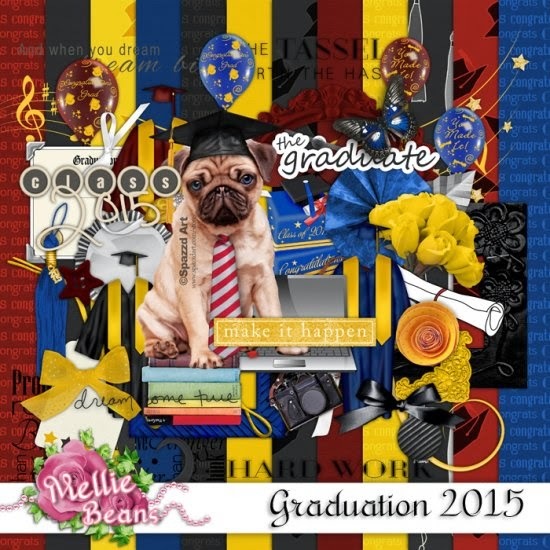 Resize & Position to left side lower part on books and corner of diploma. Copy & Paste to layer just above books. Resize & Position add to the top of your books. Select the Eraser Tool and Erase the cap from the layer. Blend the gown in with the books as I have done. Copy & Paste to top layer. Resize & Position add right side upper corner of books. Rotate if you wish as I have done. Copy & Paste to top layer. Resize & Position add to top of your star tag. Copy & Paste to layer just below music. Resize & Position add to lower right side (duplicate) mirror image by pressing ctrl+B. Copy & Paste to layer just blow tube. Resize & Position add to the center top of tubes head. Copy & Paste to layer just below balloon 2. Resize & Position add to right side of other balloon. This tutorial was written by SpiceAng on April 15th, 2015. Any resemblance to any other tutorials is purely coincidental! You may not copy/paste any part of my tuts elsewhere, but you may text link to them for challenges etc! Copy & Paste to bottom layer. Resize & Position to the center bottom of your tube. Cope & Paste to top layer.. Resize and Position to center bottom of tube. Copy & Paste to top layer. Resize & Position to the left bottom corner. Copy & Paste to layer just above frame2. Resize & Position to the left bottom behind tube. (Duplicate) select copy and then mirror image by pressing ctrl+B. Copy & Paste to layer just above tube. Resize & Position add to center bottom. Flip by pressing ctrl+M. Copy & Paste to top layer. Resize & Position add to the right bottom corner will need to rotate some. Copy & Paste to layer just below beads. Resize & Position to right bottom. Fit in behind your other elements. Copy & Paste to top layer. Resize & Position to the center bottom center it with tube. Copy & Paste to layer just below tube. Resize & Position to upper part of your work. Then duplicate as many times as you like. Just place them and resize where you wish. She comes with other color layers and options. This tutorial was written by me on April 14th, 2015. Any resemblance to any other tutorials is purely coincidental! You may not copy/paste any part of my tuts elsewhere, but you may text link to them for challenges etc! You can purchase her kit from here. Tube or Image of choice, I am using a FTU Tube *2013-2014 Tats HDSL (FREE)* By ©Ismail Rac can be found here. Copy & Paste Resize & Position to left side of your work. Copy &Paste to bottom layer. Resize & Position add to center of your canvas. Copy & Paste to layer just above s25. Resize & Position add to right bottom corner. Copy & Paste to layer just above s25. Resize & Position add to right bottom behind s11. Flip by pressing ctrl+M. Copy & Paste to layer just above s25. Resize & Position add to right bottom behind s11 and s16. Blend in. Copy & Paste to layer just above s25. Resize & Position add to right upper corner. Copy & Paste to layer just above s25. Resize & Position add to center bottom of s25. Copy & Paste to layer just above s25. Resize & Position add to right side behind s74. Blend into the background. Copy & Paste to top layer. Resize & Position add to right side. Flip by pressing ctrl+M then place to look as if sitting on the handle of basket. Copy & Paste to layer just below tube. Resize & Position add to either side of tube bottom. (Duplicate) then flip by pressing ctrl+M and add copy to the opposite side of the tube. Copy & Paste to top layer. Resize & Position add to left bottom blend in with the tube and beach sign. Copy& Paste to bottom layer. Resize & Position to fit inside your s25. This tutorial was written by me on April 13th, 2015. Any resemblance to any other tutorials is purely coincidental! You may not copy/paste any part of my tuts elsewhere, but you may text link to them for challenges etc! 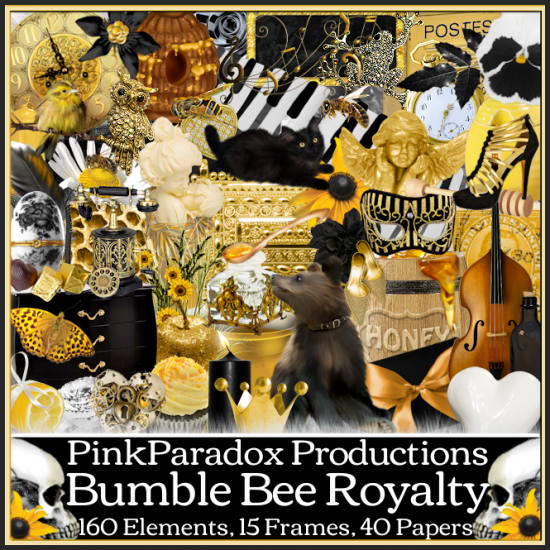 **New CT Tag** Scrap Kit of choice, I am using a PTU Scrapkit called *Bumble Bee Royalty* By Pink Paradox Productions. Copy & Paste to bottom layer. Resize & Position add to the center of your tube. Copy& Paste to layer just below tube. Resize & Position add to the left bottom corner. Copy & Paste to top layer. Resize & Position to the center of tube. Copy & Paste to top layer. Resize & Position add to the left bottom corner. Flip by pressing ctrl+M. Copy & Paste to layer just above frame. Resize & Position to left bottom. Flip by pressing ctrl+M. Copy & Paste to top layer. Resize & Position add to left bottom place so the bee look as if it is on the spoon of honey. Copy & Paste to top layer. Resize & Position add to the left bottom place on the honey barrel. Copy & Paste to layer just above frame. Resize & Position add to right top corner of frame. Copy & Paste to layer just below your tube. Resize & Position add to right bottom corner. Copy & Paste to layer just above frame. Resize & Position add to the right bottom behind (38). Copy & Paste to layer just above frame. Resize & Position add to right bottom behind (39). Blend in as you like. Copy & Paste to layer just above frame. Resize & Position add to the center bottom center. Use your eraser tool to erase the grass below frame. Copy & Paste to layer just above grass. Resize & Position add to the right bottom. Flip by pressing ctrl+M. Copy & Paste to layer above your grass. Resize & Position add to the right bottom blend it in between your tube and the other elements. Copy & Paste to bottom layer. Resize & Position to the cneter top. Copy & Paste to top layer. Resize & Position to the left top corner of frame. Copy & Paste to top layer. Resize & Position to the right bottom corner. Copy & Paste to top layer. Resize & Position to the right top corner. Copy & Paste to layer just above bear. Resize & Position to right bottom. ( Duplicate) with copy mirror image by pressing ctrl+B. Copy & Paste to layer just above tree. Resize & Position to center just above frame. Copy & Paste to layer just below your first frame. Resize & Position to fit in the frame. This tutorial was written by SpiceAng on April 10th, 2015. Any resemblance to any other tutorials is purely coincidental! You may not copy/paste any part of my tuts elsewhere, but you may text link to them for challenges etc! You can purchase her amazing kits in her store here. Cope & Paste to layer just above frame.. Resize and Position to the left side bottom corner of frame and rotate as I have done. Copy & Paste to layer just above frame. Resize & Position to the left side just behind your last element (36). Copy & Paste to layer just below tube. Resize & Position to the left side down in the corner of your frame and blend in with your other elements. Copy & Paste to layer just above frame. Resize & Position add to the left side upper part of your frame. (Duplicate) then we need to mirror image the copy by pressing ctrl+B. Copy & Paste to layer just below tube. Resize & Position add to the right side down in the corner of the frame. Then you can flip as I have done by pressing ctrl+M. Copy & Paste to layer just below element (39). Resize & Position to right side just behind your cup element and put off to either side. (Duplicate) then flip by pressing ctrl+M and move if you wish to your liking. Copy & Paste to layer just below element (43). Resize & Position to the right side behind your other element and adjust to your liking. Copy & Paste to layer just above frame. Resize & Position to left side top corner of your frame. (Duplicate) then we are going to add the copy to the other side by pressing ctrl+B. Copy & Paste to top layer. Resize & Position to center of your tube. Then select your eraser tool and then erase the bottom part of your tube as I have done. This tutorial was written by me on April 9th, 2015. Any resemblance to any other tutorials is purely coincidental! You may not copy/paste any part of my tuts elsewhere, but you may text link to them for challenges etc! Tube or Image of choice, I am using a PTU Tube *Friends* By ©Laguna can be found here. Copy & Paste. Resize & Position to center of canvas. Copy &Paste to bottom layer. Resize & Position add to the bottom and place in the middle behind your tube. Copy & Paste to layer just above frame. Resize & Position add to the center bottom just under tube. Copy & Paste to layer just below tube. Resize & Position add to the right bottom of your frame . Copy & Paste to layer just above Spring Garden67. Resize & Position add to the top of Spring Garden67 and resize to blend in as I have done. Copy & Paste to layer just below tube. Resize & Position add to bottom center and add so it is behind you tube as I have done. Copy & Paste to layer just above frame. Resize & Position add to the top right corner of your frame. Duplicate then we are going to mirror image it by pressing ctrl+B. Copy & Paste to layer just below your tube. Resize & Position add to top of your barrel element and flip by pressing ctrl+M. Copy & Paste to layer just below tube. Resize & Position add to left side behind your money friend and blend in as I have done. Copy & Paste to top layer. Resize & Position to left side and add as you wish. Duplicate and add as you wish. Copy & Paste to layer just below barrel layer. Resize & Position add to right side right behind your barrel and add to blend in with green leaves. Copy& Paste to layer just below tube. Resize & Position to bottom and place so it fits behind tube layer and up against the water fountain. Copy& Paste to top layer. Resize & Position add to right side up next to bridge layer. Copy& Paste to bottom layer. Resize & Position add to center of your frame. This tutorial was written by me on April 8th, 2015. Any resemblance to any other tutorials is purely coincidental! You may not copy/paste any part of my tuts elsewhere, but you may text link to them for challenges etc! 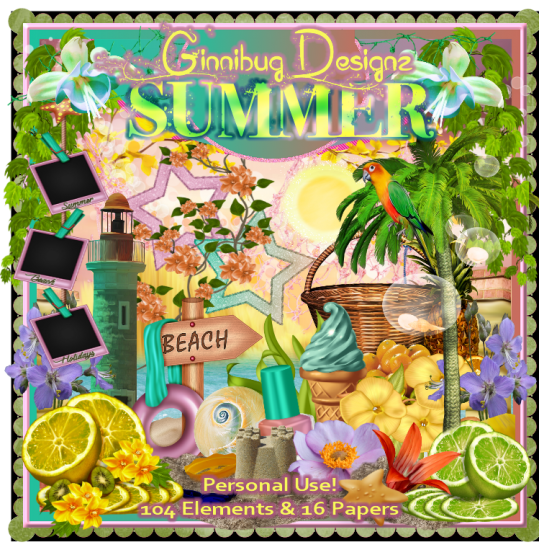 **New CT Tag** Scrap Kit of choice, I am using a PTU Scrapkit called *Summer Dream* By Pink Paradox Productions. Copy & Paste to canvas. Resize and Position add to the left side of your work. Copy& Paste to layer just below tube. Resize & Position add to the center of your bottom frame. Copy & Paste to top layer. Resize & Position to the bottom left side and add up next to your tube. Copy & Paste to layer just below tube. Resize & Position add to the right side of your tube and toward the bottom of your frames as I have done. Copy & Paste to layer just below Summer Dream (16) . Resize & Position add to the right side and flip by pressing ctrl+M and adjust so that the handle is behind your bag. Copy & Paste to layer just below your tube. Resize & Position add to right side of your tube and add as if part of the hat she is in front of. Add up against the bag element as I have done or where you would like. Copy & Paste to top layer. Resize & Position add to the right side down in the corner of your bottom frame. Copy & Paste to layer just above tube. Resize & Position add to left side place it as if the glass is in your tubes hand. Then if you wish you can use the erase tool and erase what is over the finger as I did with mine. Copy & Paste to layer just below your coca nut layer. Resize & Position add to right side and place behind the coca nuts. Copy & Paste to layer just above your top frame. Resize & Position add to the right side of your work and place up behind your bag layer. Flip if you wish as I have done with mine by pressing ctrl+M. Copy & Paste to layer just above your bottom frame. Resize & Position add to the bottom center so that it fits under all your elements. Copy & Paste to bottom layer. Resize & Position add to the center of your top frame and resize to your liking. Copy & Paste to layer just above bottom layer. Resize & Position add to the left side to top corner of your bottom frame. Use the eraser tool to erase some of the element if you wish to do as I have done. Duplicate and we are going to mirrow image it by pressing ctrl+B. Copy & Paste to layer below your towels. Resize & Position add to the right side top corner of both frames. 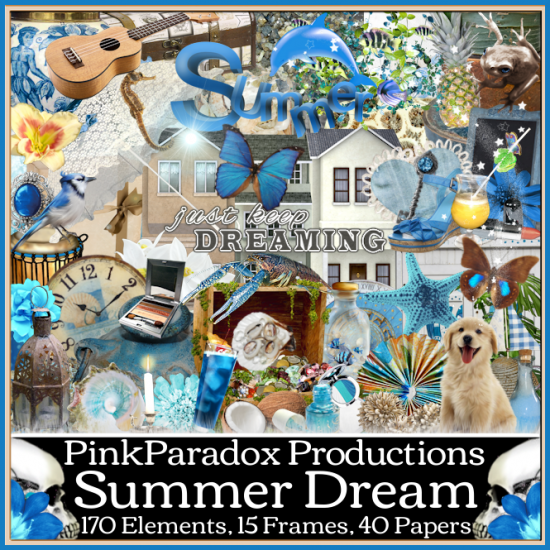 Copy & Paste to layer just above Summer Dream (160). Resize & Position to the right side up in front of your other plant element and blend it in to fit. Copy & Paste to layer just below umbrella. Resize & Position to the right side up in front of your other plant element and blend it in to fit. Copy & Paste to top layer. Resize & Position to the right side up in front of your other plant element and blend it in to fit. Copy & Paste to layer just above your top frame. Resize & Position to the left side up top corner of your frames and right behind tube. Adjust element and then duplicate a couple more and add down the side as I have done. This tutorial was written by SpiceAng on April 7th, 2015. Any resemblance to any other tutorials is purely coincidental! You may not copy/paste any part of my tuts elsewhere, but you may text link to them for challenges etc! Copy & Paste to your canvas. Resize & Position off to right side of your work area. Copy & Paste to bottom layer. Resize & Position to the center bottom of your work. Cope & Paste to top layer. Resize and Position add to the left bottom of itw59. Copy & Paste to layer just below your itw47. Resize & Position to bottom center and blend in with itw59. Copy & Paste to bottom layer. Resize & Position to the center of your work so it blends in with your other elements. Flip if you would like to as I have by pressing ctrl+M. Copy & Paste to layer just below tube. Resize & Position add to the bottom just off to the right side of center. Copy & Paste to bottom layer. Resize & Position add to the right side of your then flip it by pressing ctrl+M. Copy & Paste to layer just below itw106. Resize & Position to right side and blend it as I have done. Copy & Paste to layer just below tube. Resize & Position to center of your work as I have done or as you wish. Copy & Paste to layer just below itw59. Resize & Position to bottom center and blend in behind your other elements. Copy & Paste to layer just below itw163. Resize & Position to left side bottom and blend in with the other elements. Copy & Paste to layer just above itw139. Resize & Position to right side up by the moon then use your eraser tool to erase some of your bats on the left side of your tube. Then duplicate and flip copy by pressing ctrl+M. Copy & Paste to layer just below tube. Resize & Position to left side not to far from center. Duplicate for it to show up brighter.